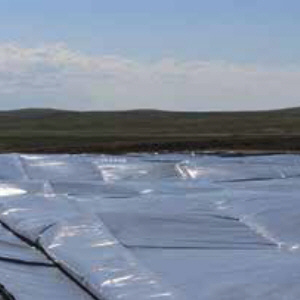 GeoFlex HT30 & HT40 are co-extruded textured linear low density polyethylene (LLDPE) geomembranes containing carbon black and ultraviolet inhibitors to ensure protection against harmful UV degradation. HT Series one-side textured LLDPE provides increased friction, elongation and flexibility. Available in black and black/gray color options with the gray side providing a cooler surface against contrasting colors and a vital function for ease of damage detection during installation. Click here for Product Data Sheet.